AKIPRESS.COM - The cities of Kyrgyzstan are filled with Soviet-style buildings, sprawling markets, and ornate mosques. However, outside of the bustling, metropolitan streets of Bishkek and Osh, wonder awaits: A journey deeper into the wilder parts of Kyrgyzstan treats the senses with turquoise alpine lakes, towering snowcapped peaks, and sweeping walnut forests. 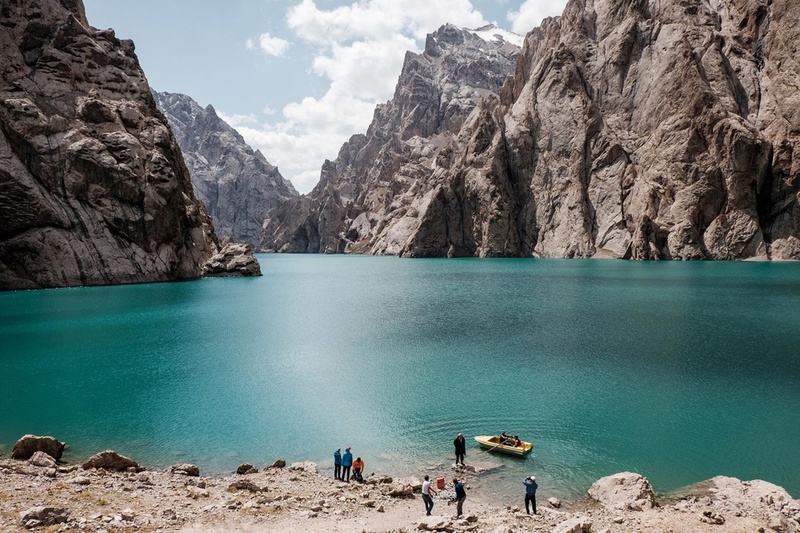 Today, Kyrgyzstan’s rugged landscapes, unique nomadic heritage, and fascinating Silk Road history attract outdoor adventurers and culture enthusiasts alike. Read on to learn about eight of the country’s most spectacular spots. Just 25 miles outside Bishkek, Ala Archa National Park’s striking gorge is one of the most beloved nature areas in Kyrgyzstan. In Kyrgyz, ala archa refers to the variegated juniper trees that adorn the canyon in every direction. Traditionally, Kyrgyz people use juniper to protect homes and ward off evil spirits. In Ala Archa, they’re a backdrop for a variety of year-round outdoor adventure activities, including hiking, trekking, and skiing. From Bishkek, hire a taxi or rent a car for the 30-minute drive to the park entrance. Once inside, take advantage of the trails, lodge, and seasonal recreational areas. In the high-altitude region near the Chinese border, an alpine lake hides between craggy rock formations. Water from the nearby snowcapped peaks drains down into Kol Suu’s wide basin during the summer, creating its vibrant turquoise color. Its sheer isolation—and the juxtaposition of sparkling blue water against sandy rock—make Lake Kol Suu such an alluring destination. Given its remote location, it’s fairly challenging to reach. Hire a knowledgeable local guide from the nearby city of Naryn to drive the four-hour journey over bumpy, unpaved roads, finishing the last leg on foot or horseback. Near the lake, you can stay in a yurt camp or pitch your own tent. What sets Arslanbob apart from Kyrgyzstan’s other mountain regions is its 11,000-hectare walnut forest, the largest in the world. The walnut forests, which originally drew settlers to Arslanbob in the third century B.C., have provided a major Kyrgyz export since the time of Alexander the Great. Today, the region draws thousands of tourists from around the world. Situated between the Fergana and Chatkal mountain ranges in western Kyrgyzstan, Arslanbob hosts visitors to celebrate an annual walnut harvest in late September or early October. The region is also home to picturesque waterfalls, hiking trails, and centuries-old Muslim tombs. To reach Arslanbob, take a marshrutka (a local minibus) from Jalal-Abad or Osh. From Arslanbob’s town center, hire a local guide to show you around the hiking trails and attractions within the forest. 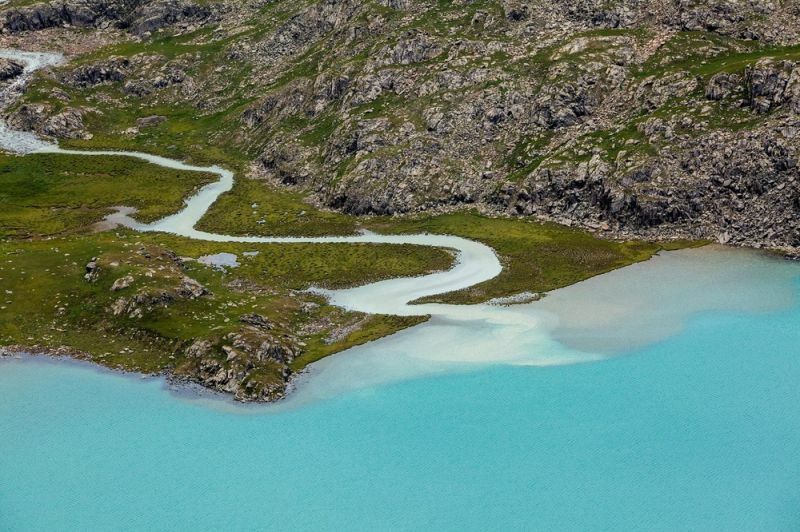 More than 11,000 feet above sea level, Ala-Kul is a picturesque alpine lake in the snowcapped Terskey Alatau range. Today, it’s one of Kyrgyzstan’s most popular trekking destinations thanks to its accessibility from the nearby city of Karakol and proximity to massive Lake Issyk-Kul. Lake Ala-Kul can only be reached on foot by a steep hike that typically takes more than one day to complete. 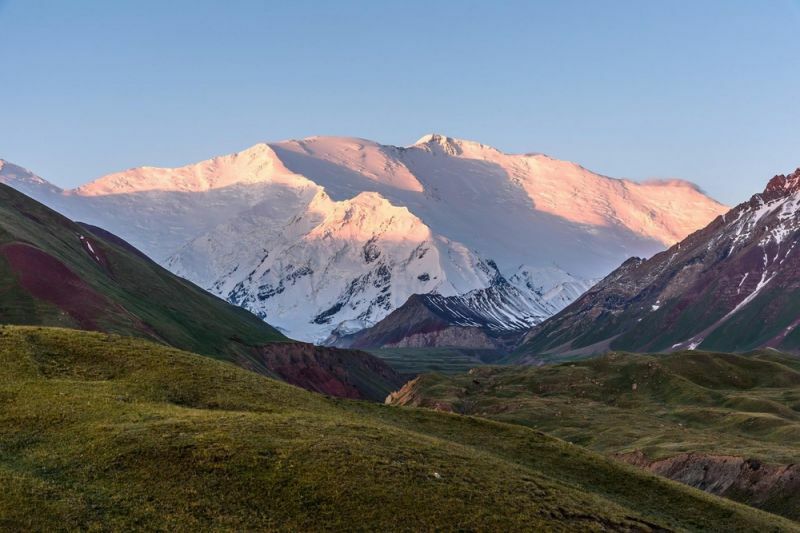 Travelers can reach the Ala-Kul trailhead by public transportation from Karakol, or by riding a horse to the base of the final ascent. 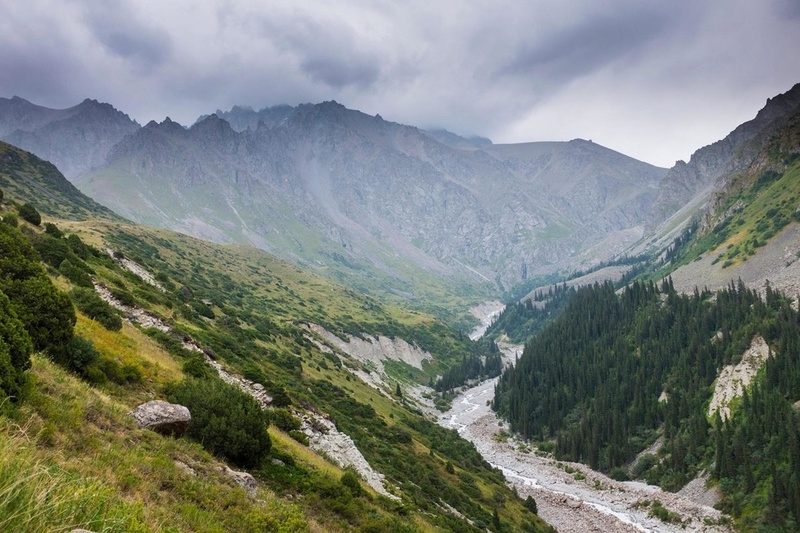 Most travelers pair a trip to Ala-Kul with a post-hike soak in the nearby hot springs in the valley of Altyn Arashan. 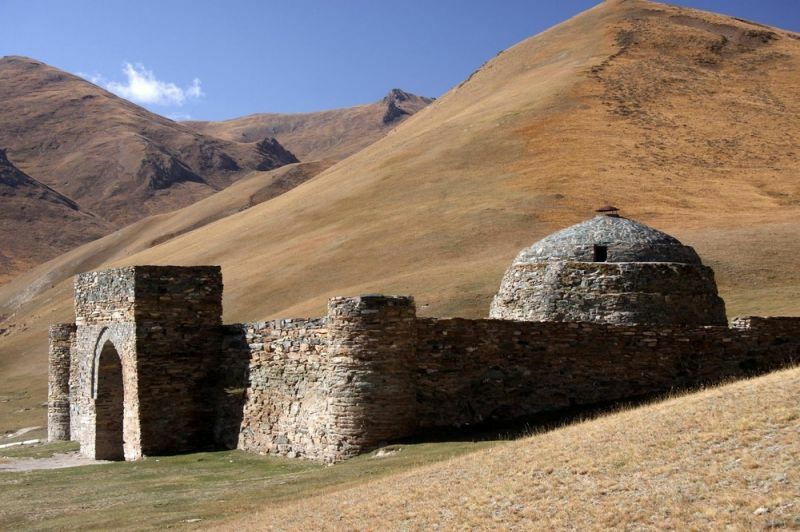 Tash Rabat is one of Kyrgyzstan’s most well-preserved Silk Road caravanserais, important waypoints that served as marketplaces, educational institutions, and inns for traders along the route. Constructed in a remote valley between the At-Bashi Mountains in southern Kyrgyzstan, Tash Rabat’s isolation enhances its beauty. While tourists can enter the caravanserai for a small fee, the more spectacular views are from the surrounding hills overlooking the area, and a few hiking trails that lead to Chatyr-Kul, a massive lake and nature reserve area. The unpaved roads to Tash Rabat can be difficult to navigate, so it’s best to hire a local driver through the community-based tourism office in nearby Naryn. To extend your trip, pair it with a trip to Kol Suu Lake or spend a night in the Tash Rabat yurt camp. 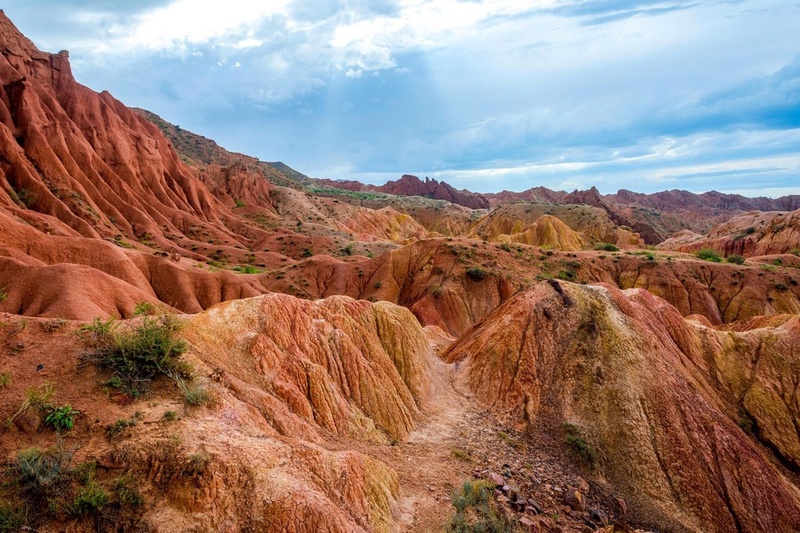 On the south shore of Lake Issyk-Kul lies an otherworldly, colorful canyon with striking, jagged rock formations, formed from millennia of ice, water, and wind erosion. Skazka Canyon—meaning “fairytale” in Russian—is the subject of many local legends. Its central rock ridge resembles a dragon’s spine, with two parallel, vertical rock faces surrounding its main trail. To get to Skazka Canyon, follow signs from the main road on the south shore of Issyk Kul, near the village of Kaji-Sai. Hoping to spend more time? Take advantage of the yurt camps near the canyon’s entrance. 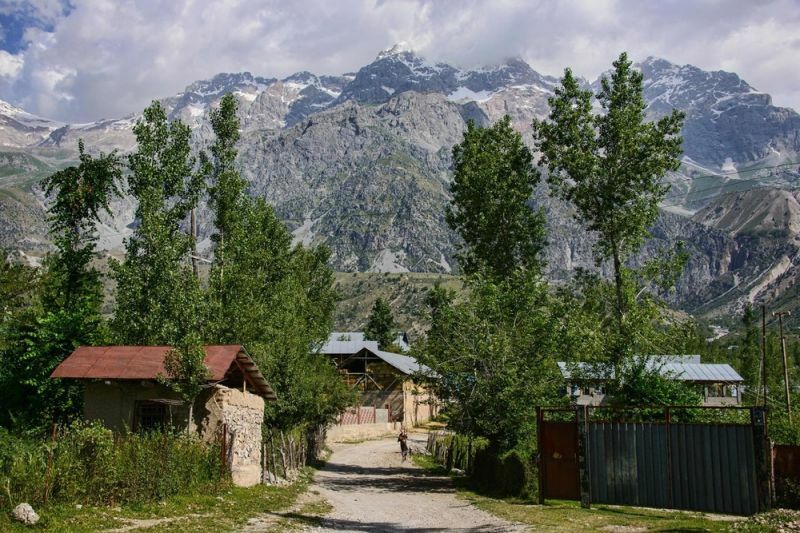 A small, traditional Kyrgyz village located near the south shore of Lake Issyk-Kul, Bokonbayevo is a great home base for multiday treks and horse-riding excursions exploring the Terskey Alatau Mountains. It’s also home to one of Kyrgyzstan’s most important traditions: eagle sports. 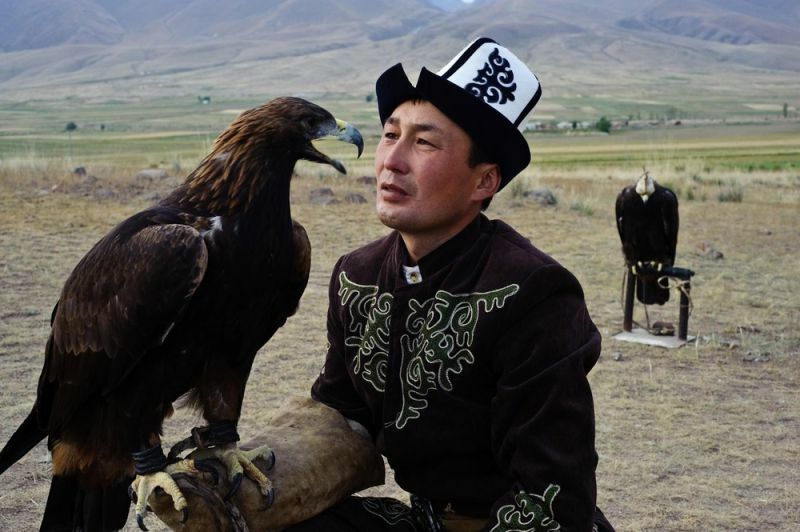 Salburun hunters have trained their eagles along Issyk-Kul’s southern shore for centuries, and today showcase their heritage at the annual Birds of Prey Festival. Getting to Bokonbayevo is straightforward: You can take a direct marshrutka from Bishkek or Karakol. There are plenty of guesthouses in Bokonbayevo’s town center, plus a tourism office where you can hire a local guide for treks into nearby nature areas.